So…I could have sworn I wrote a review about this already, but upon searching through the last few posts of my site…nope…! I totally imagined it. Haha. For all the hype it received, I wasn’t too impressed with this movie. Now don’t get me wrong, I love Sandra Bullock and George Clooney’s acting in general, and to be honest I think they did great with what little they had. The core of my frustration was with the story, and there was only so much of it to tell because ironically, for all the space (“space”) they had, it was a pretty limited set. Vaguely reminded me of that Ryan Reynolds movie, Buried (2010). I don’t really consider what I say next to be a spoiler, but some people may see it that way, so if you’re not looking for any, I suggest that you stop right here and just skip the the end if you’re curious about what I rated this movie. I always bold my ratings so it should be easy for you to find it without reading through everything. Still with me? Okay. Then here’s what I thought the movie basically was in a nutshell: 99.9% of it was Bullock’s character panicking and flailing around helplessly for a majority of the movie (which I think is realistic, given the situation she’s in), Clooney’s character keeping as cool as possible (because every story usually has at least one character with a level head…plus he provides some comic relief), and a good portion of predictability (because come on, even when at one point Bullock’s character seems “safe,” there were plenty of hints to let viewers know she wasn’t totally out of the woods yet). About 0.1% of it was waiting for something to happen—I don’t know what I was waiting for exactly, but I was definitely waiting for something—and of course it never did. Also, a bit of a random thought, but in some ways I thought that names weren’t really necessary for the characters. I don’t even remember what they were. They kind of just get lost in the panic. I’ve heard people say this is a remake of Marooned (1969). 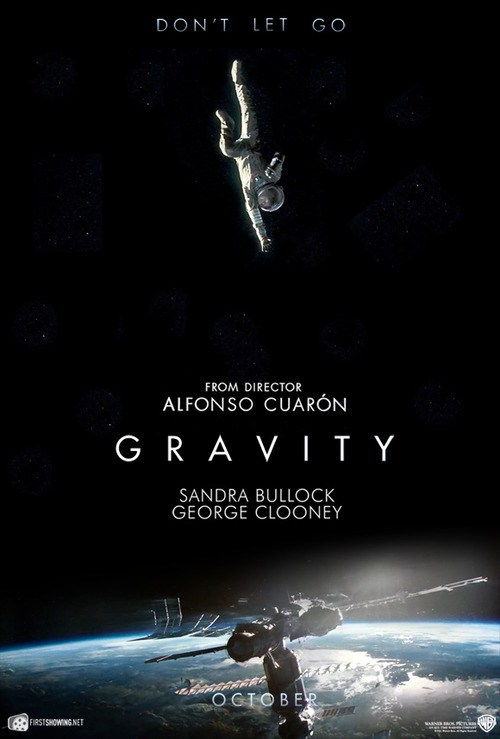 I haven’t watched that one, so I can’t comment on that, but I have taken a look at the description, and even the movie poster kind of reminds me of Gravity. I also heard that Robert Downey Jr. was originally cast for Clooney’s role, and after having watched it, I could see that. I wonder if he would have portrayed the character as calm as Clooney did, or if he would have brought more sarcasm to the role. I could see him doing both. Another person I could totally see having played Clooney’s part was Robert Williams, for some reason. Maybe even Jude Law, I don’t know. On the other hand, I don’t think I could have imagined anyone else replacing Bullock; I think she was a good casting choice there. I think Johansson was in the running at one point, but somehow I think she probably would have shown us a very different character. This is one of those movies where the more I think about it, the less satisfied I feel with time. I do remember there being a point where I thought to myself, “just how long are they going to drag this out?” The ending was also a little hard to believe for me. Then again, I’m neither a scientist nor an astronaut, so I can’t comment on the accuracy, but it really did seem like a bit of a stretch. This isn’t a movie I’m likely to pick up again to re-watch later on. Good review Rae. I didn’t hate it, nor did I love it. I just appreciated the look and feel, but despised the screenplay. HAH! I just realized I totally forgot to mention about the set itself. That was definitely cool, but because the story wasn’t all too interesting to me, the novelty wore off quick. I was asked if I would like to do a discussion/review on Gravity and I passed stating that going in – there can be but two outcomes – Bullock’s Stone and Clooney’s Kowalski – either or noth – are either saved , or theiy’re not. Whic doesn’t allow for much in the way of story and or chracter development. Clooney’s Kowalksi was Clooney-esque – and that was no surprise. And that is always fun. Bullock’s Stone had more to work with – panic, stress, calming down, etc – but the whole back story seemed stapled on only to give her character a backward focus. As you said Rae, and so did Dan, the story is ho-hum. Still you’ve got to give Cuaron a big thumbs up for for putting it together as a visual tour-de-force. I especially liked your last remark Rae – because this will likely be the case – this film won’t be as good on a re-watch, if there is a re-watch. Yup. Actually, I was kind of hoping they’d do something more outrageous with it…like I don’t know, maybe they found life elsewhere, or something. Haha, I feel like that would have made for a more interesting story. Again, like I mentioned in my response to Dan’s comment…I fully meant to give credit to the awesome visuals, but I totally forgot that while writing up the entry. How scatterbrained of me, I know. I really don’t think I could stand to watch this again. I was checking the time pretty frequently towards the end of the film. I had a feeling this would be a disappointing movie. I also have a feeling it’s one of those films I’m going to end up watching, whether I want to or not. Thanks for the warning. HAHA. How’s that? Curiosity or because a friend will likely drag you to see it? Thanks for stopping by, and sorry for the late reply! I finally got around to watching it this weekend. I actually enjoyed this one since it was short and didn’t drag on like so many of the crap movies I’ve seen recently. What strike me as odd was when Clooney’s character was asking Bullock’s character if she had a family, kids, etc. Wasn’t this discussed while they were in outer space for how many hours before? You know, to be honest, I was so bored by that point I don’t really remember, haha. Funny how you didn’t think it dragged. I think I had the opposite opinion there.